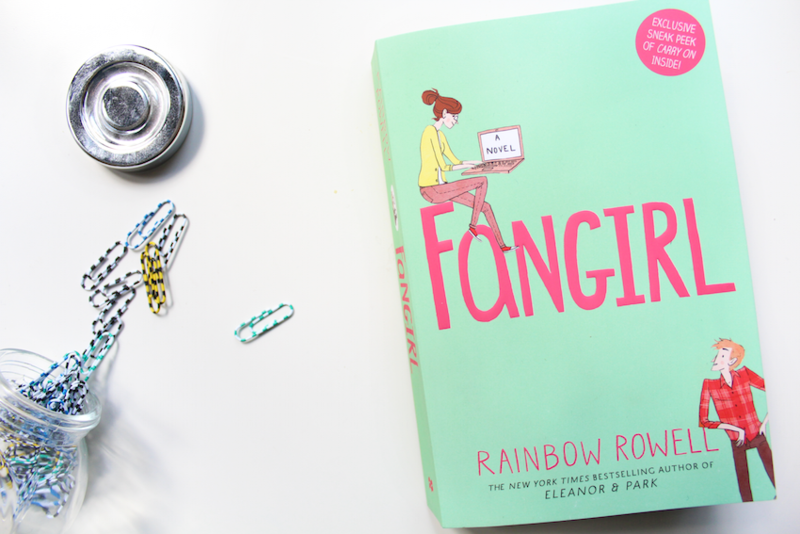 FANGIRL BY RAINBOW ROWELL || REVIEW | RAWR BOWS. I used to be a bookworm, I was always reading some book -more like devouring one. However, in the past year I’ve just felt like I had too much on my plate to pick up a book and get lost in it. I recently went to Waterstones and literally spent there at least 45min trying to decide which book to get. As the grown up woman I am, I ended up in the YA section and picked up a book I had read so many good reviews about: Fangirl by Simon Rowell. I am aware this book has been out for a while now that many of you have probably read it already but hey, better late than never! I barely have anything bad to say about this book. I loved it from the first page to the last one, it’s honestly one of the best books I’ve read. I’m not going to spoil anyone but I’ll try to briefly explain what the book is about so that the review makes more sense. The book is based around the lives of two twin sisters from Omaha in their freshmen year in the University of Lincoln. One of them, Cath, writes a fan fiction about Simon Snow and Baz that gets thousands of hits. She’s the typical geeky fangirl we’ve all been at some point in our lives, no shame. Back when they were younger, they used to write the fan fiction together but eventually Wren -the other twin- grew out of the fandom and dived into the full uni experience (i.e. drinking until you pass out and partying probably a bit too much). The book follows the girls around and allows you to watch them change and grow as their freshman year goes by. Anyone who’s in uni or have been in the past will probably relate to some of their experiences (including boyfriends, one of which was a mixture of Lucas Till and Zac Efron in my mind, that made the book even more enjoyable) and things they go through, same goes for anyone who’s or has ever been in a fandom. It’s the first book I’ve found that not only talks about fanfictions but shows how important they can be to someone, how they can be more than a simple story published on the Internet. I found really interesting how the sisters behaved so differently and how this affected their relationship. The only thing I didn’t quite like were the extracts from Cath’s fanfiction that are in the book when Cath reads them to a certain someone. But that didn’t bother me too much, I just skipped these bits and since they don’t really affect the story it doesn’t matter if you skip them. I personally wasn’t interested in reading a fanfic about something I didn’t know and from the few bits I read, it didn’t seem to interesting to me. The whole book is so beautifully written you’ll get immersed into it without even realising and you’ll find yourself getting angry at Wren, wanting to hug Levi for being so damn cute or feeling sorry for their dad. I would definitely recommend this book to anyone who’s into romantic/funny YA books. Btw, if any of you have read Eleanor & Park please let me know if you liked it because I really want to read it!